Muse collaboration with The Streets was "a bit of a laugh"
Muse: horsing around, as usual. It's hard to imagine Matt Bellamy doing anything lightheartedly, but he and his bandmates have revealed that Who Knows Who, a collaborative effort with Mike Skinner of The Streets that's recently surfaced on the internet, is nothing more than the sound of a few musicians larking about. 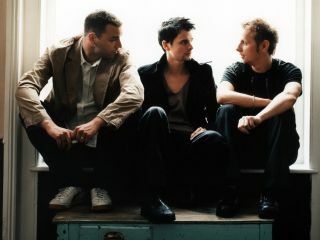 The song, on which Muse provide the backing and Skinner the vocals, had been tipped by some to appear on The Streets new album, but a message on the Muse website puts this rumour to bed. "The track was the result of a late night jam session and something we did for a bit of a laugh featuring a blues riff we have been playing live recently upon which Skinner recorded some vocals," it says. "It is not intended to be a serious release so we are happy for it to be leaked around unofficially". This being the case, MusicRadar is more than happy to direct you to a place where you can download the song. Decide for yourself whether it's japery or genius.